Mollie Carter, ’14, remembers the first time she saw the steel sculpture of The Mustang, rearing back on its brick-and-mortar base in front of the Whipple Administration Building. “It was one of the first symbols that grabbed my eye when I started at MSC in August of 2010,” she said. The sculpture made the small-town girl feel “a little bit more like, ‘Hey, I can do this.’"
For her last photo after commencement, the Oriskany Falls, NY, native joined a line of students in caps and gowns, waiting to pose with their diplomas in front of the mustang. Jawann Haynes, ’10, was planning a memorial service for the victims of the Virginia Tech shootings in April of 2007. There was really only one choice for the location. “I knew I wanted to do something,” the Brooklyn native said, “but I didn't know what. Another RA and I decided on a memorial for the victims, but also to make it a place for us to grieve together. Since it was dedicated in the fall of 2004, the steel sculpture in the Administrative Quad is the first thing many visitors see. For many students, it has become integral to Morrisville pride. The sculpture was donated to the college by Arnold Fisher, one of Morrisville’s most loyal supporters, who has served on the College Council and was a founding member of the Morrisville College Foundation in 1967. 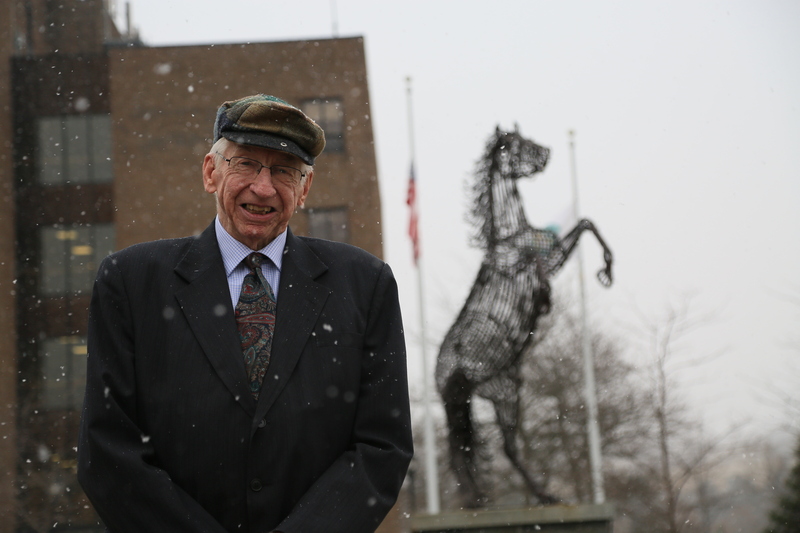 His dedication is such that the college’s Dairy Complex bears his name, and he has received many other citations for his service to Morrisville. “I wanted to do something to honor this place,” Fisher said. “We’ve grown to offer so many special programs, done so many good things. When I thought about a sculpture, there was only one image: The Mustang. Esther Benedict of Esther Benedict Sculptures, Ltd. of Pipe Creek, Texas, is originally from New York, and her late father and Fisher were lifelong friends from the age of 5. Benedict has a special link to Morrisville that made her eager to be a part of the sculpture project. “I had wanted to go to Morrisville out of high school,” the Newark High grad recalled. “I wanted to be in the horse program, but there just wasn’t space that year.” She went to SUNY Delhi instead, then decided to study to become a farrier. “I learned to work with steel. 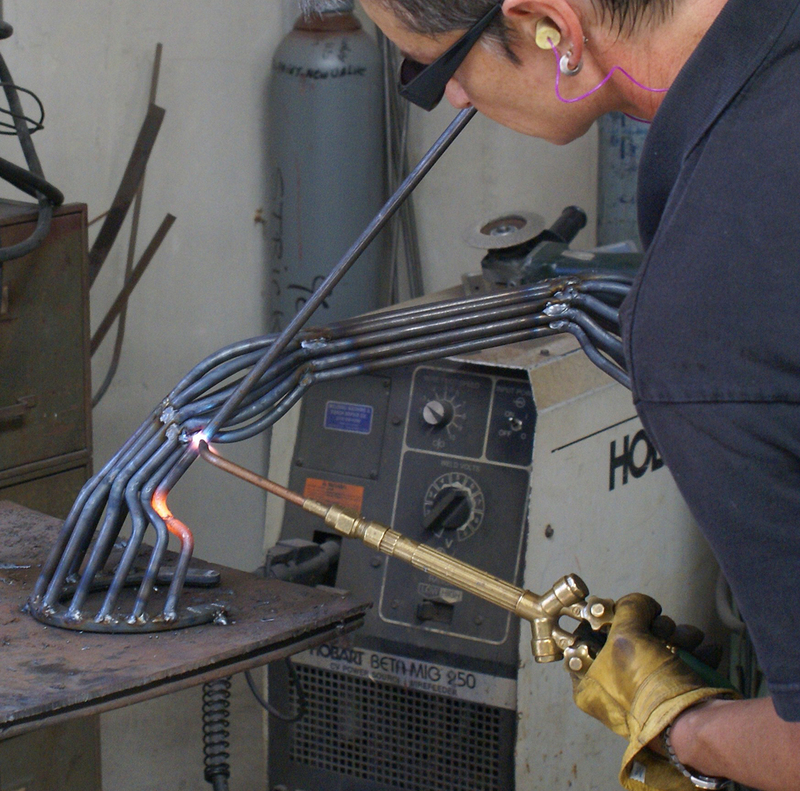 I loved how pliable it was—the interesting colors that came out when you hot-rasp (use a metal file to remove burrs from the steel) it,” she said. In 1991, she started the transition to sculpture. Benedict and Fisher decided The Mustang would be 15 hands high, rearing up on its hind legs in a pose that communicates strength and independence. The sculpture was created from cold-rolled steel rods, quarter-inch (diameter) for the body and half-inch for the mane and hair. Benedict had it sand-blasted, then chemically rusted it to achieve a consistent coat. It took about eight weeks of steady work to complete it. Heather Foster, ’10, a member of the women’s soccer team, took inspiration from the sculpture. “For me, the statue was an encouragement on game day,” said the DeRuyter, NY native. “It was a quiet place to eat lunch when you wanted to escape the busy food areas. And it was a reminder that Morrisville was a strong community that stood up for you, even when you thought you'd never see the last midterm or final. “It was there to say, ‘You can do this. Morrisville stands for you."